The Supreme Canvas Christmas Wreath Bag from Tiny Tim Totes is better than it's word. Clean up after the holidays are a snap. It's as easy as placing your artificial Christmas wreath in the bag, zip it up and safely store it away until next year. Because our bag is a full 30 inches long, 30 inches wide, and 8 inches deep, you will have no problem storing artificial wreaths up to 30" in diameter. The Supreme Canvas Christmas Wreath Bag from the Tiny Tim Totes has sturdy vinyl carry handles for easy transport. No assembly required, just unpack, unfold, and insert your wreath. Made of premium Oxford canvas. Sturdy Carry Handle for transporting your artificial wreaths. 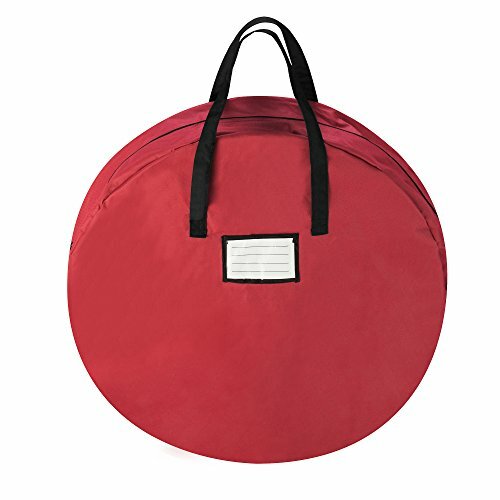 Holds up to a wreaths up to 30" in diameter. Designed to protect your wreath from damage, dust and moisture! ► Dimensions 30" x 30" x 8"